It’s the end of an era. After winning both the singles and doubles titles at the past two regionals, the Bears failed to keep the streak alive and bring home a third consecutive pair of titles. But they retained the most important crown of all: the team title, awarded to the school whose players earned the most points cummulatively. 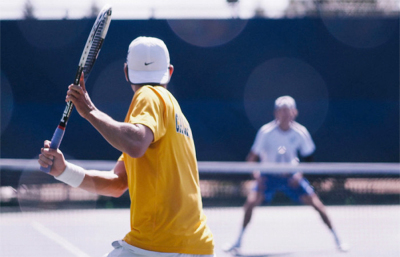 Over the weekend, Cal sent its entire squad to the USTA/ITA Northwest Regionals in Palo Alto, California, where they faced off against the likes of the host, Stanford, and other Pac-12 competitors Oregon and Washington. The biggest success story of the weekend for the Bears was the third-seeded duo of sophomore Andre Goransson and junior transfer Oskar Wikberg reaching the finals of the doubles bracket. Ultimately, however, their run ended in a heartbreaking loss in a third-set tiebreaker to San Francisco’s Bernardo Saraiva and Nils Skajaa. The loss puts their record at 4-1 as a doubles pair. “That’s the emergence of a new team for us,” said head coach Peter Wright. In the singles matches, most of Cal’s representatives were knocked out in a flurry of upsets on the first day of the tournament. The last man standing was 17th-seeded freshman J.T. Nishimura, who advanced to the quarterfinals with an upset victory over John Morrissey, the third seed, from Stanford, but Nishimura lost once he got there. He was defeated in two sets — 6-4, 6-2 — by Stanford’s David Hsu, who was seeded ninth in the tournament. While the results didn’t match the overwhelming success that Cal has experienced in the past few years, Wright was encouraged by the fact that they were able to earn the team title. Also reassuring was the progress the Bears demonstrated during their matches. Even in their losses, as a team, Cal managed to play competitive tennis throughout the tournament. Players implemented many of the techniques emphasized in practice, such as in-between point routines, an indicator that the efforts of Wright and his coaching staff have been fruitful. With several players scheduled to play two matches in one day, the Bears began to tire. Wright believes that the team’s lack of conditioning likely contributed to some of the struggles but doesn’t see it as a cause for concern and has his sights set on the spring season. With regionals wrapped up, the fall season is beginning to wind down for the majority of the team. But the Bears returned to Berkeley battered and bruised. “(With regionals completed) some of the guys will be shutting it down for the rest of the fall and continuing to practice into November,” Wright said.